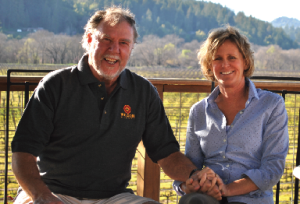 Ken and Diane Wilson always loved the Alexander Valley tucked north of their home in Healdsburg. When the opportunity arose to include deLorimier Winery in their mix of vineyard properties they jumped at the chance. With old vine bordeaux varietals hanging from the vine and the rolling hills of the Alexander Valley surrounding the property, there was no looking back. Even the rocky Russian River banks at the base of the property called their name. This gorgeous estate property is large enough to house weddings and large events and the harvest full moon rising over the property stole their hearts. With gold medals on their first new releases, deLorimier is well on its way to becoming their premier Cabernet Sauvignon winery.